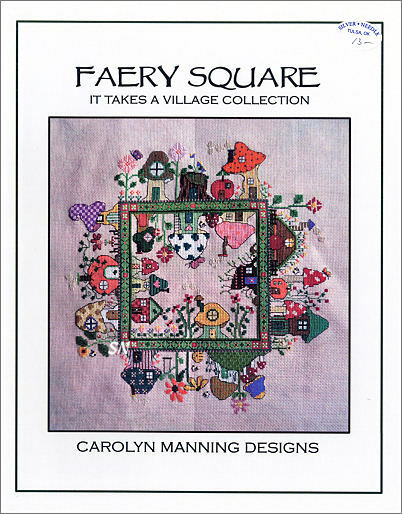 This is the CUTEST little village of funny little fairy houses! 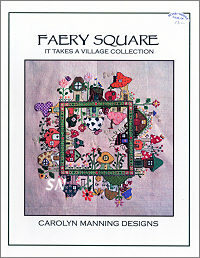 Each of the 8 sides are different, each has funky, strange, quirky and fascinating little abodes... don't you kind of wonder who lives in them? 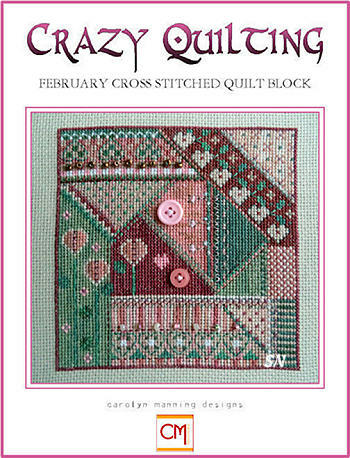 Finishing just 10 x 10 on 18 Aida or 36ct linen, this is worked with 28 shades of DMC floss, and I think it would come even more alive with some beads and metallic accents added here and there! Then... which side is going to be your top? 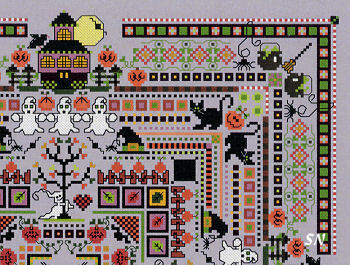 I like the pumpkin house between the yellow spotted and purple checker-boarded roofs! Presented as a chart. 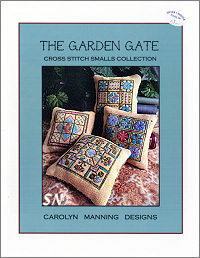 This is a collection of 4 nine-patch small designs. 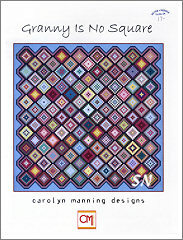 Each bitty square is only about an inch... so each cushion design finishes approx 4 x 4 on 14ct. 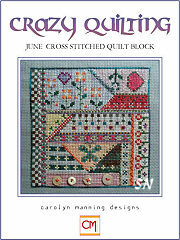 Colors are coded for Sulky thread... so if you don't have that in your stash... you can use the chart cover as a color guide to choose your own colors, or use the conversion table on the Sulky website. 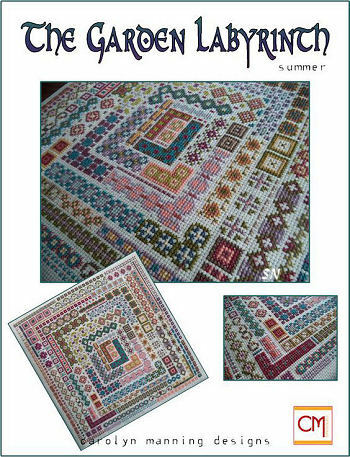 These would make stunning biscornu smalls - especially if you stitch a design on each side! Presented as a chart. 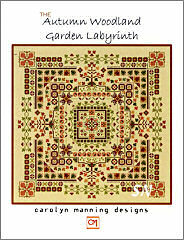 Here is another big geometrically organized garden of little stitched bits and borders by Carolyn Manning. 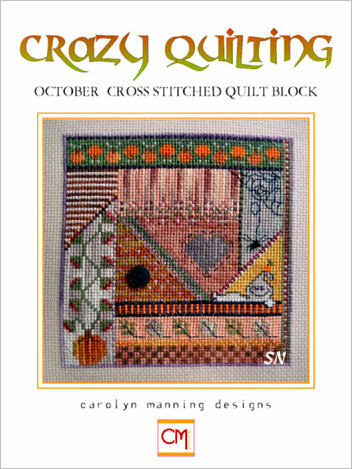 We have quite a few other designs by her that look summery, or quilt-y... this one definitely speaks Halloween! 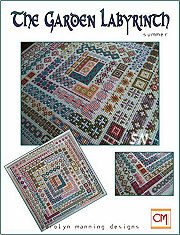 Measuring 207 x 207 in stitch count, it will finish approx 11-1/2 inches square on either 18 Aida or 36ct Linen, and is charted for 23 different shades of regular DMC floss. 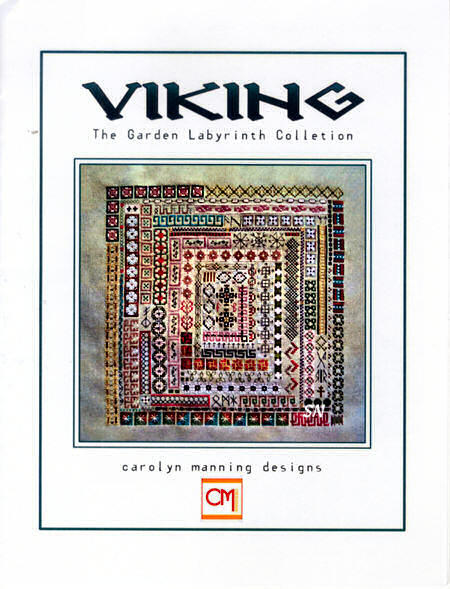 Carolyn's designs are super fun to add beads and metallic threads to... especially THIS one! Look at all the fun stuff in here! The black cats (Wisper or Simply Wool?) 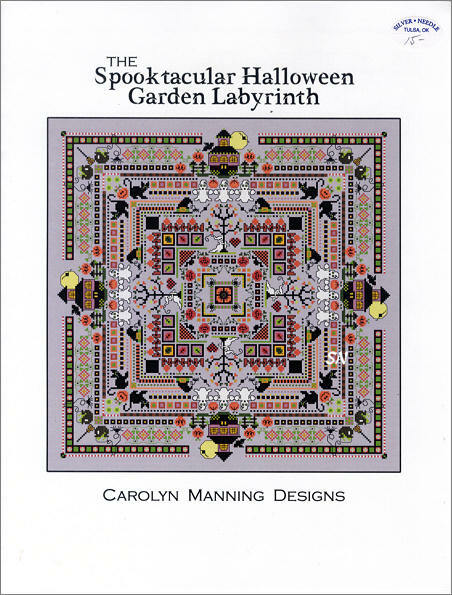 are cute, the ghosts could be opalescent, moon -- gold metallic, beads everywhere in those geometric borders. 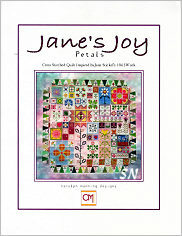 All the cute tiny motifs arranged and bundled together really tease your eye and create a big and bold medley. It's just fun to stop and notice the small details in here! 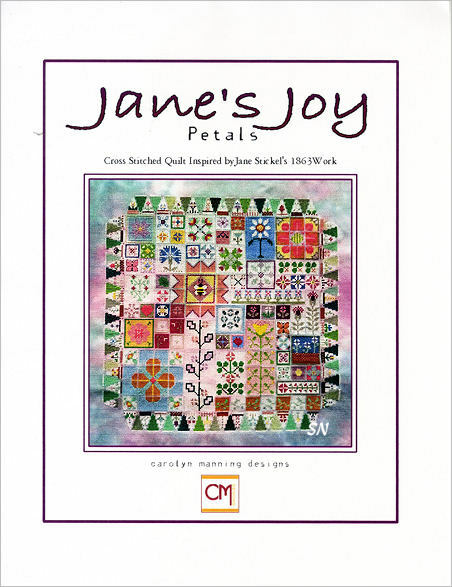 Offered as a leaflet. 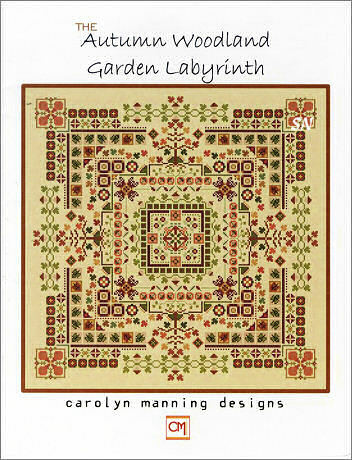 Another of Carolyn's Garden Labyrinth designs, this is worked in 16 shades of Gentle Art's hand-dyed pinks and greens. 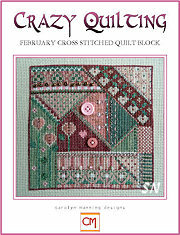 The stitch count measures 187 -- so this will finish 10 x 10 on 18ct. 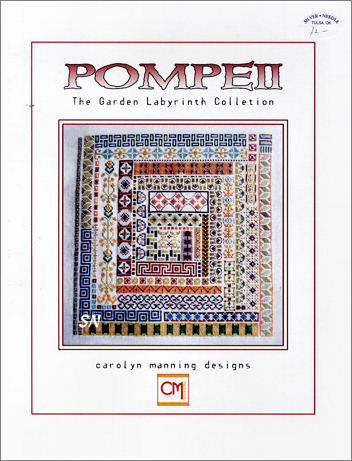 There are Algerian Eyelets in here... but nothing else too complicated. Will you start in a corner an just meander downwards, or will you be a center-starter and work you way out border by border??? 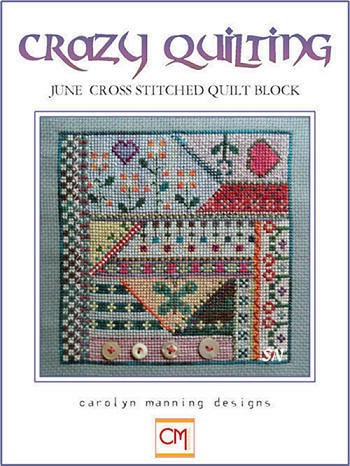 Will you turn your fabric so your crosses alternate? 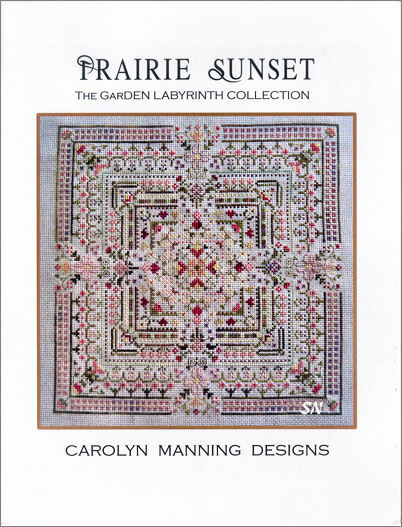 We are collecting quite a number of these charming and colorful designs by Carolyn Manning. 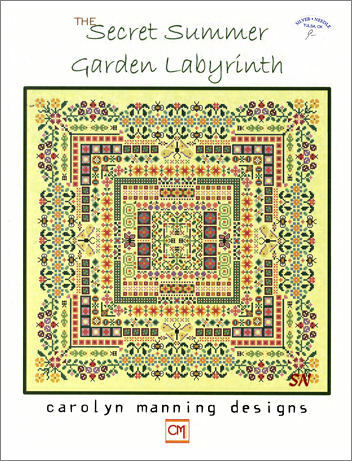 Some look like quilt squares, while the labyrinths look like seasonal garden mazes. 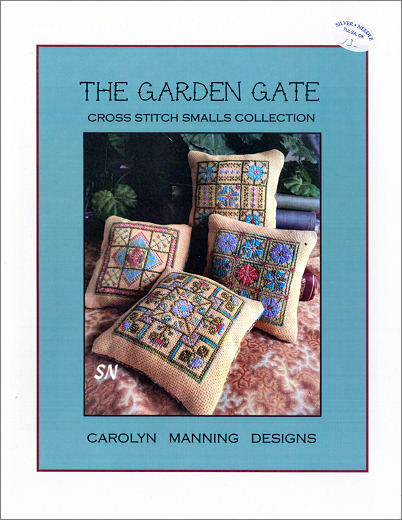 All offered as charts, they call for DMC or hand-dyed flosses and contain just regular cross stitching. 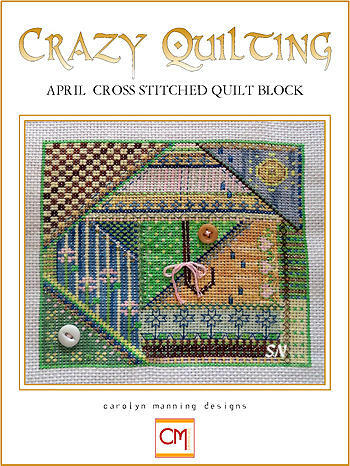 What beautiful things to construct into decorative bed pillows... or maybe just a three-inch pin cushion stitched from a teeny design section somewhere! 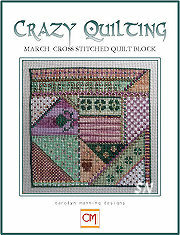 Finishing just 9 x 9 on 36ct... this looks so big... but 9 x 9 is PETITE! Coded for DMC floss, each little house is really only about 20 x 30. 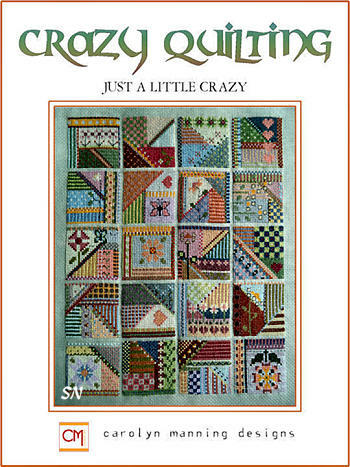 Wouldn't it be NEAT all stitched in one long row????? 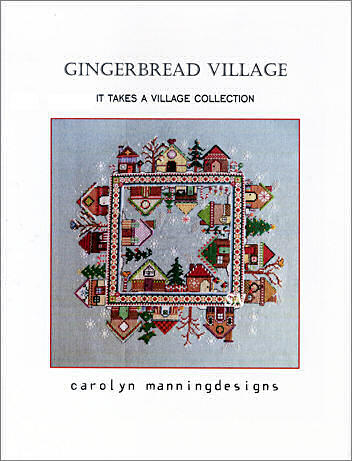 (If my feeble math works, I count about 410 stitches long.) Just cute as can be... presented as a leaflet. 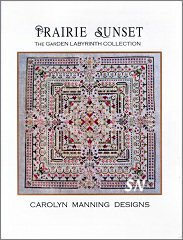 We have four new designs right now... here are three of them that catch my eye! 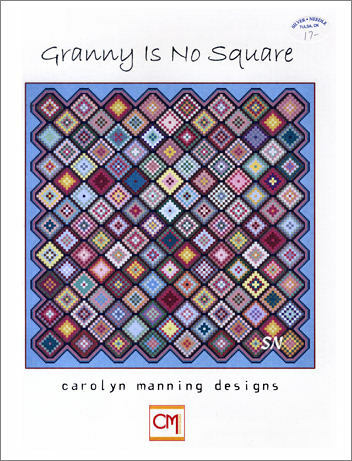 Granny is No Square -- Talk about repetitive motifs! This is a way to use fun colors!!!! 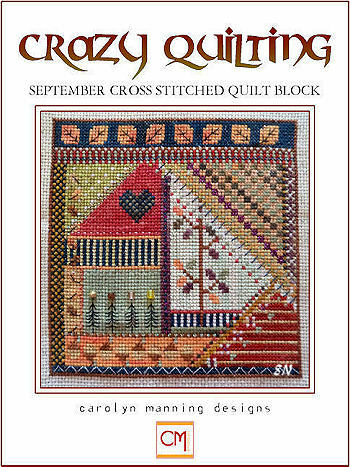 The stitch count of this is 228 x 224 -- solid stitching -- and it finishes approx 16 inches on 14/28ct. You'll know right away if you've mis-counted in this one! 42 Different DMC shades -- multiple skeins of a few of them. 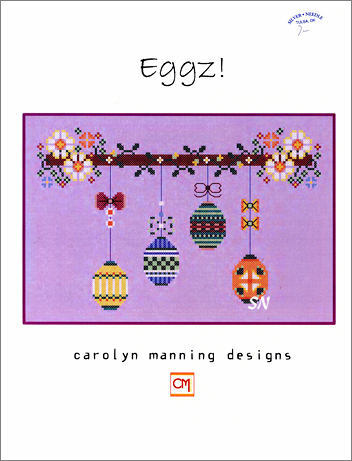 Eggz -- We think this would be cute for next Easter. 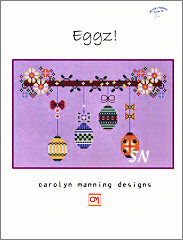 I think just the individual eggs would be pretty nestled in a basket of grass and candy! They are only 22 x 16! 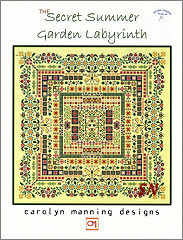 The Secret Summer Garden Labyrinth - Another of Carolyn's wild patches of borders... this one is a super-colorful explosion of TINY stylized flower shapes and assorted bugs! 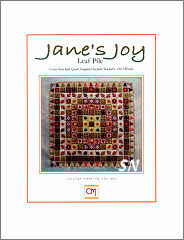 Stitch count is 210 square -- so it'll finish a very busy 13 inches on 32ct. 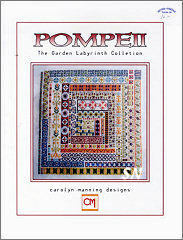 Pompeii -- Another in Carolyn's 'garden set' of designs... some of the geometrics in here remind me of a Greek scroll. 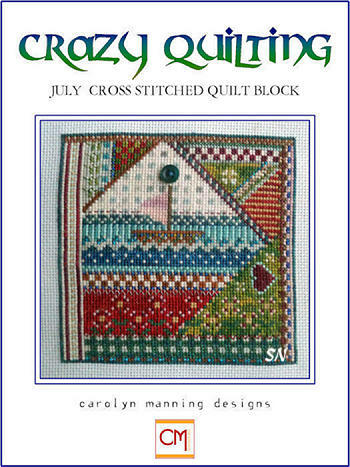 This measures 154 stitches square and will finish approx 11 x 11 on 14/28ct. 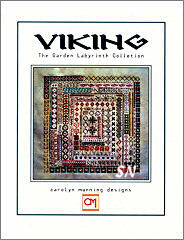 Coded for Gentle Art's Sampler Threads. 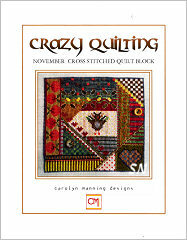 Carolyn Manning is publishing a set of 5-1/2 inch square Cross-Stitched quilt blocks with a crazy quilt personality. 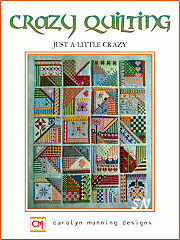 Presented in chart format -- sometimes with a few button or bead embellishments, but not always -- they are kind of cute! 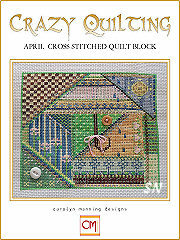 Choose any fabric... each is charted for Sampler Threads and a little Kreinik metallic braid. 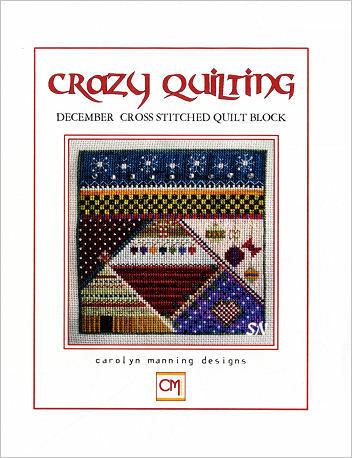 I think, actually, that they would be really pretty all stitched together on one piece of fabric. Or, if you can... put them into a quilt! Her pattens within the sections are really charming -- I LOVE the colors in May!!!! Six Charts out so far... we can put you on an auto to get the rest of these! 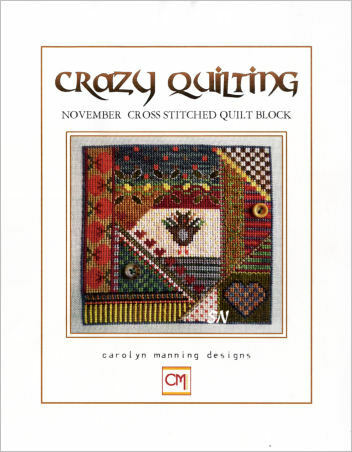 Prices vary, but you can get an idea from what we already have. 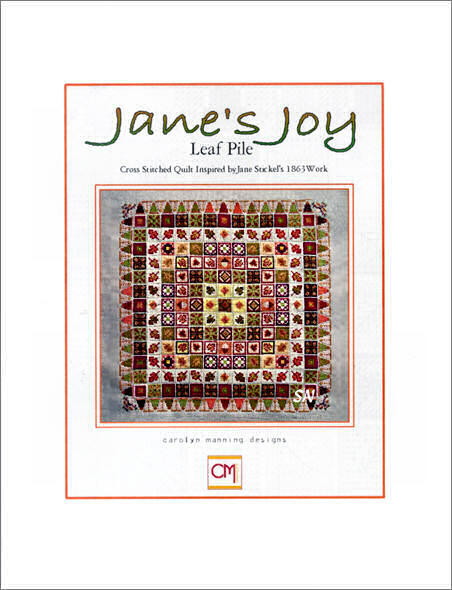 choose fabric once you have your charts. 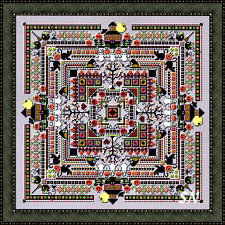 This is a cross stitch of a 1863 quilt! 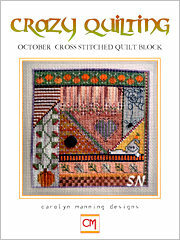 finishing approx 13 inches square on 14/28ct, it calls for 44 colors of DMC floss. There are no embellishments on it, but wouldn't some buttons and charms be fun on here?? 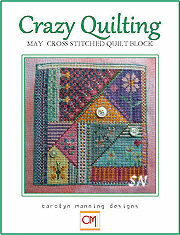 Oh wow, this is a super-fun design loaded with thread, stitching and finishing possibilities! 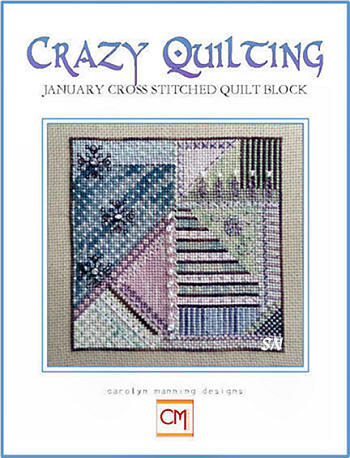 24 Miniature designs to companion Carolyn's monthly Crazy Quilt Cross Stitched blocks, each of these little squares measures just 30 x 30 stitches and resembles a tiny Crazy Quilt! 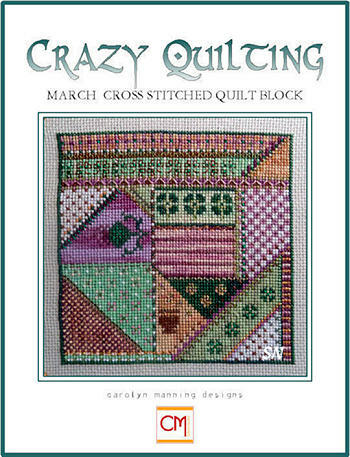 Presented as a chart -- both black and white AND colored charts in here, everything is coded for DMC floss. 63 Of them in total! 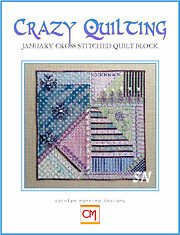 Stitch them all lined up as shown, or make a bunch of pin cushions or cubes, or something long and skinny for a long and skinny wall! 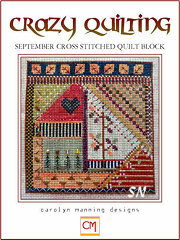 Change out some threads, add beads or charms where-ever -- there is so much you can do with this set of designs! 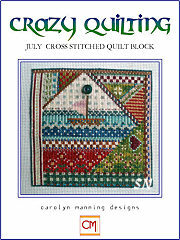 THEN... check out our monthly set of Carolyn's Crazy blocks... we are up to July so far -- All of those measure about 5-1/2 inches square on 14/28ct, and are full of fun details. Very cheerful and colorful!